A step in the right direction? Major shift in the UK’s government attitude to climate change | Watts Up With That? I’d like to bring some points to the attention of your readers that were raised in an article in the Independent published on 11th May 2013 It would appear to indicate a major shift in the UK’s government attitude to climate change. I find it very surprising that there has been so little reaction to a member of the Prime Minister’s Parliamentary Advisory Board using the phrases “the case for global warming was far from clear-cut.” and “built into climate models.” in the UK national press. Could it be that reality is seeping in?? Interesting how the issue is framed as a loss of talent rather than the beginnings of a return to sanity. But, as the saying goes, there are three sides to every story. What is remarkable is the reluctance of said nebbies ( Brit slang for nebulous personalities) to stay and fight their corner when the catastrophists hold the commanding heights of UK governance. Either they don’t like it up ’em or there is conclusive evidence available to them that the scam is blown. Alternatively, they may be scampering away to a more protected employment in the EU. For those who don’t know of him, Peter Lilley is one of the few scientifically trained lawmakers in the British Lower House and has recently been making tsumamis in the UK climate alarmist world. Yes, there has not been much coverage of this in the UK press, although ‘The Guardian’ (a left-of-centre, pro-Green Agenda newspaper) today (11 May) printed a story condemning the appointment of Peter Lilley and alleging him to be funded and backed by ‘big oil’. Of course The Guardian never complained when previous ‘pro-Green’ Government Ministers all had substantial business interests in ‘Green’ industries and investments. The UK Treasury’s attitude was signalled two months ago in the budget, when the ceramics industry was exempted from the climate change levy. Now they need to extend the exemption and encourage fracking, but the Liberal Democrats are still true believers, so I’m not holding my breath. About time too. My energy bill has gone from £95 per month to £137.50 over the lifetime of this parliament & the blood suckers say they want more for windmills & an extended grid to distribute the power. Meanwhile the wholesale price of energy hasn’t changed. We’ve switched Drax (4GW) to burning WOOD when it is sat on the the biggest coal seams in the UK. They are shutting down coal fired power stations and old nuclear ones. No one is building natural gas power stations because they won’t pay for the standby time when the wind IS blowing. So even the regulators are predicting brown-outs in the next parliamentary term. YOU COULDN’T MAKE THIS INSANE STORY UP. So I’ve told my local MP. If he doesn’t fix it I will vote for someone who will. Simples. PS I could rant on for pages but we’d all get bored. Welcome to the UEA world. It’s taken a very weak economy to finally see some cracks of light for these types. Of course there are those of us who have been saying all along that a cap on carbon is a cap on progress and the economy. For those in the government-green energy “complex,” they all knew this was an expensive Ferrari they could only afford if the bubble kept roaring upward, science-be-damned. kicking and screaming . . .
PS The only joyous thing in this sorry story is that the Marxist idiot who implemented most of these stupid ideas has been put in jail for 8? Months on an unrelated issue. The Lord works in mysterious ways. “an exodus of senior energy and climate change advisers ” Where are they going to? Zimbabwe? Liberia? Burundi? It might be good news to UK but it could be one of the most negative global development. The exodus of the British “greenies” could be to more strategic places in the EU, UN, and other international organizations where they will have more funds and leverage over clientele that easier to manipulate and scare. Energy experts? I wonder what makes them experts? Support for renewables perhaps? We are trying to point out that soaring energy prices, declining temperatures and the possibility of energy rationing is a toxic recipe for a govt hoping to be re elected in a couple of years time. Osborne, for all his many faults, is a climate sceptic and it looks as if the ‘shale-gas’ of change is blowing through government. Man made warming is a crock, it always was and intelligent men and women perceived the evident truth of this political scam [MMGW] long, long ago. The dimmest of lights, are always to be found in the political sphere and here in Britain, the diminished wattage of most of our political claque is no secret. Hence, it has taken them longer to be switched on than everyone else, unfortunately due to the green agenda the current is intermittent and do not expect the pace of illumination to be anything other than glacial – it may take an ice age. type of fuel will be used to make electricity? It will never again be oil, that I can guarantee. Smart meters to be introduced to move to a demand supply either by switching off consumers during periods of high demand and low supply or by massively increasing charges when supplies are low. A color map of the world’s countries should be rendered according to their government’s propensity to inact green laws. Reality would dictate that the more green the government, the more brown the country should be colored; and the more skeptical the government, the more green the country should be colored. Humans used to get up with the sun and go down with the sun. I suggest that approach be used for the UK until they mend their ways–for the next several decades, let them have electricity while the wind blows and none when it doesn’t. At least they’d learn the lesson of cause and effect. One wonders how long it will take us to work through them all…….. The Independent article got their “theologies” confused. Who cares? As long as they go and stay gone. The bigger problem is repealing the 2008 Climate Change Act when only 2 MPs voted against it. No major party is making it an issue and senior government figures have their hands in the till with “renewables” subsidies. Fear of UKIP is not yet running deep enough. They need persuading that if powers cuts happen as a result of the expensive green “no-energy” policies, then, come election time, they will be crucified. I Jeremiah No Mates do concede that these do resemble actual if minuscule indications of a possible, potential but lets not bank on it change afoot. Except…how do I break this to you, the wind blows or not irrespective of whether its day or night. I think solar is your better target. “The Green Taliban” That they are. As botched as our energy policy is it is hard to imagine one more insane than the one adopted in Britian. I wish to the gods our Spanish Government had the same gumption for a dare like that. Of course, here the”progressive” press ( that is, the press sold out to the “left and green supremacy” would raise hell . Australia should see similar positive developments after our Federal election scheduled for September 14th. The ALP is really on the nose with the Australian public and is tipped to lose massive amounts of seats. The Liberal/National Coalition, when in government, is likely to carry out wholesale pruning of “Climate Change” and “Renewable Energy” bureaucrats thereby easing the burden on Australian taxpayers. I wish it would happen sooner. The British government is legally obliged to comply with the Climate Change Act 2008. … And there is no evidence of that! The issues facing us are stark. The windmill programme is designed to destroy our power grid’s ability to deliver despatchable energy thereby imposing a significant change on our economy, in effect making us third world. The Marxist thought behind this, predicated on Agenda 21, is some form of payback for the effects of colonialism but in turn these people are being manipulated by the Eugenicists in the background, see ‘Population matters’, the elite run organisation planning this part of the programme. So, imagine London with 50% power on, power off, just like Karachi or Islamabad but in the midst of the new Little Ice Age. Did someone mention CO2-AGW? It cannot happen because CO2 is used by the planet to regulate temperature, the working fluid of the Heat Engine. I have often commented that my electricity bill in Spain is more transparent and it lists the costs of supply as about 48% of the bill total, and that taxes and subsidies account for 52% of the bill total. I have often suggested that those in the UK do not know how much they are already paying towards the green agenda. Last week the Chairman (or CEO) of Scottish & Southern Energy was interviewed on Hard Talk. He said that the costs of supply were only about 50% of the bill costs. He was then less precise as to what the other 50% pertained to, but gave the impression that 25% was green energy costs and 25% was to meet government policy dealing with insulation and fuel poverty. It is government policy to subsidise the costs of insulating homes and to assist those in fuel poverty (which may of course include bad debts/invoiced sums which the company cannot realistically collect due to the economic circumstances of the customer, eg., the customer is on benefits or working part time on the minimum wage). Whilst that may be government policy, it is the consumer (and not the company) who always pays; Accordingly, it is the consumer who can afford to pay their bills who effectively pays to subsidise others receiving incentives/subsidies/or even free insulation. It is the consumer who can afford to pay their bills who effectively pays for those in fuel poverty. This has driven up bill prices by about 25%. Of course, if bills were not so expensive there would be fewer who could not afford to pay their bills and therefore this element could be reduced by cheaper elecricity prices. Likewise if energy was not so expensive, less money would be spent on insulation which is often not cost effective (eg., double glazing may take more than 15 years to pay back and if energy was cheaper the pay back time may be more than 25 years). The green element is presumably the costs of erecting wind farms and solar arrays, but it may also include the cost that the company has to pay for the higher cost of supply from these sources including the feed in tarriffs that it pays to consumers who supply the grid with domestically produced green enery. The executive was not entirely clear on this and the BBC interviewer did not press him to explain. I have often commented that electricity prices could be almost halved if only there was political will. I make that comment upon the fact that my Spanish bill clearly states that the cost of supply is only about 485 (sometimes it is as little as 47.3% presumably this minor difference has something to do with market costs). It would appear that the same applies in the UK. The government is therefore being very disengenuous when it suggests that ‘green’ matters are only adding nominal sums (may be presently only about £75 or so). In reality, people are already paying about £600, and that will only escalate. PS. The hard Talk interview is probably available on BBC iplayer. From what I have read in the free newspapers, my understanding is that the Spanish government is cutting back on the subsidies that are paid for green energy production since these have become unaffordably high. Further, the government has been embarassed by the solar scam, whereby producers of solar energy were supplying the grid on a 24 hour basis and getting generous feed in tariffs. This came as somewhat of a surprise since the sun does not shine at night, but then it was found that quite a few suppliers had hooked up diesel generators to supply electricity to the grid when the sun was not shinning. The costs of running the diesel generator was less than the earnings from the attractive feed in tariffs being paid for green energy production. It certainly would help Spanish consumers many of whom are struggling to make ends meet due to high unemployment etc, if energy prices were reduced. Since more than 50% of the bill is made up of taxes and subsidies, the Spanish government could reduce electicity bills a lot if they were to further pull back from their green initiatives which are proving to be an expensive fiasco. Don’t get too excited. Nothing will change until the Climate Change part is cut from the Department of Energy part! As long as morons like Ed Davy are in place we will continue to work towards bankrupting ourselves here on the UK. The issue with wind is that it often does not blow when demand is at its peak. In the UK, energy peak is winter nights, especially cold winters. The last few winters have been cold in the UK due to a blocking high sitting over the UK/Northern Europe. This blocking high has allowed cold frigid air to hover over the UK. There has been little wind when that blocking high was in place. These weather conditions went on for about 4 to 7 weeks. A couple of winters ago, I monitored wind power output every day during those blocking highs. During this period, wind was producing typically between 3 to 5% of nameplate/installed capacity. There were a few days when it produced as much as 8%, but tyhis was more than offset by the number of days when wind produced less than 3% of nameplate capacity. As you know wind in usual conditions produces about 22% to 28% of nameplete/installed capacity. In other words, just when energy demand was at its highest, wind was producing all but no energy. Indeed, for many days it may have been a negative since often in cold conditions when the wind is not blowing energy is required to be drawn from the grid to heat the lubricating oil and to keep the rotor turning slowly (to prevent shaft/bearing problems). If the UK had been dependent upon wind to produce say 30% of its energy from wind, there would have been extensive brown out during the past 3 winters. These may have lasted for up to 7 weeks. This would have been very serious since even those with gas powered or oil powered central heating would have had no heating for lengthy periods since electricity is required for ignition purposes and to run the circulating pump. Only those with log or coal fires would have had warmth in their house. 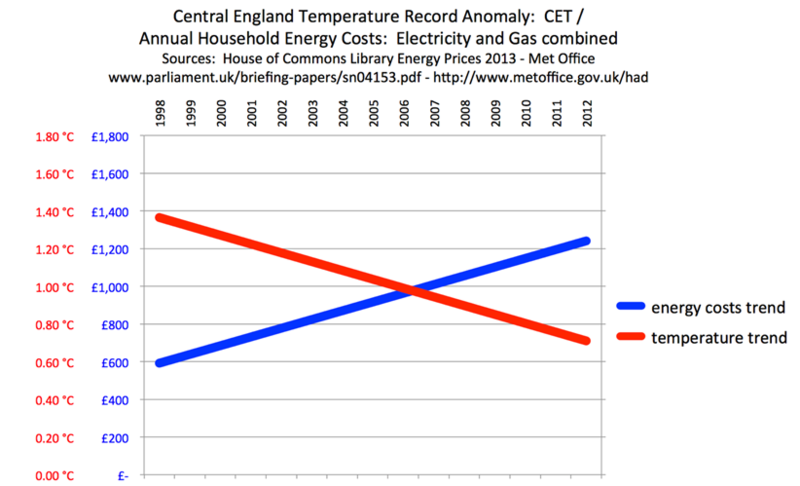 This is serious since most of the UK housing stock is old, not well insulated and damp. There would have been many deaths in this scenario especially in the old and vulnerable class. Another lustrum, or perhaps two, will be needed before the politicians realize how vacuous is the science behind the CAGW fear-mongery. In the meantime we can only hope that they do not further degrade the globe’s economies so fruitlessly with panic-stricken carbon strangulation policies. Any shift in UK government energy and environment policy, and personnel balance, can probably be summed up in two words – Owen Paterson. Our Prime Minister is a spineless PR bullsh*t merchant. He has been spooked by the recent success of UKIP and is merely throwing a few crumbs to the discontented. If there was to be another surge in support for the greens, that is where he would head. We recently buried the last PM that was prepared to follow their values rather than focus group outputs. The UK parliament is stuffed full of career politicians. Study their CVs and all you will find are student poliicians that have come through the party or local council route. Oh, and a disproportionate number of lawyers. Whilst we’re stuck with the Press and television support of the “green agenda”, and also certain left-wing members of parliament, plus the outspoken imbecile known as the Prince Numpty of Wales, we don’t really stand much chance of winning against the “establishment”. Although the general public are beginning to realise they’ve been conned, and are (apparently, according to surveys) “not bothered” about the spread of the windfarm blight, they are far, far away from actually sitting up, taking notice and doing something about it. Only the good auspices of the UKIP element hasthe right idea, and any chance of changing things – if they’re allowed to. The chances of them actually forming a government with the way the voting system in the Former UK “works”, are pretty small. So we seethe, and are virtually helpless whilst our various countries and sovereignties are wrested wholesale from us, by thoise in pursuit of common purpose. Funny, that’s exactly how I have felt over the last few years. Science is defined by the scientific method based on evidence. Models are only implementations of theory which have to be backed up by evidence. There is no room for the word consensus in the scientific world. Just look up the definition of the word. It’ll be something like “agreement of opinions, usually within politics or religion”, the places where theologies belong. I am planning to write to my local MP, to keep up the pressure. The draft is below, which asks her to justify continuation of the Climate Change Act. Any comments would be appreciated and anybody wishing to do similar is welcome to use the template. It is as in the US or in Germany: most people live in cities, where we are in no danger of a circle of 120m windmill towers with a radius of 400m being erected around us. That happens only to people who sought the tranquillity of the countryside and bought a single farmhouse in a windy spot of the country. Paul Homewood is compiling a letter to send to his MP and this can be C&P for your own use. I’ve got a couple of links that I’ll add to mine. Some time back I emailed my local guy and didn’t even get a DECC handout as a reply. So I might try again but he wasn’t going to get my vote anyway. Oops, should have gone to SpecSavers; just noticed Paul’s own post. Memo to self; refresh screen before commenting. The Lib-Dems are the fly in the ointment of sanity, that and a spineless Prime Minister leads to a total lack of an energy policy. We are trying to conduct a concerted campaign to inform MP’s of the energy situation , so if anyone has recently written to their MP perhaps they could let me know the name and constituency they represent? Incidentally, I would strongly recommend a face to face meeting at a ‘surgery’. Politicians are adept at waving away written representations. Is that the next UK flag? This would have been very serious since even those with gas powered or oil powered central heating would have had no heating for lengthy periods since electricity is required for ignition purposes and to run the circulating pump. Only those with log or coal fires would have had warmth in their house. Also note that modern gas cookers use electricity from the mains to create the ignition spark. Fortunately if like me you remember the UK power cuts of the early 1970s, you will know to keep a box of matches in the kitchen so you can light your gas hob during electricity power cuts. Agree with what you say – but i would suggest that the reason he is now in jail is not an “unrelated issue” – it is because he is a lying sh!t. He and his ilk lie because they are arrogance is far greater than their lack of knowledge. They lie because it is what they “DO”. Thankfully the Truth (usually) will out. Thank You, very much for your answer. What made me very happy was your saying that our energy bills in Spain were more transparent about the amount charged as taxes, than the bills in the UK. That felt great. Huhne, estranged from both his sons, one of whom described him as ” ‘fat’, ‘ghastly’ and an ‘autistic piece of s***’ ” in text messages read out during the court case. I guess you reap what you sow, and the sons would probably qualify as having the inside knowledge. Richard Verney………well thanks Richard, thanks for being a pedant who drones on about the obvious that anyone who has the wit to notice irony would assume the person making the joke already presupposes everyone who cares to understand already. Your a real bundle of fun. Viejicita……….Thanks Spanish Guy for caring to pay attention to our onerous situation here in the UK. Regulars may have noticed how often I speak my mind on what it actually feels like to cope with that 25% surcharge.Moreover, dont forget that its been officially stated that over the last decade power prices have increased 60% in addition to any other increases as a specific result of Green Taxes. But theres one factor youve missed. Because these costs apply to everyone, it means that everyones remaining spending ability is reduced, which negatively affects all businesses, especially smaller ones, which increases their failure rate and decreases their capacity to invest, which in turn causes my client base (as a supplier to said businesses) to shrink almost exponentially. Indeed, I now have almost none. They’ve one way or another been bankrupted or their budgets shrunk out of contention. Some I had have joined thousands of derelict baorded up buildings. I do not speak figuratively but most literally. My experience in 2010-2012 represents that of untold numbers of others. We are in effect hit from both sides, by the 25% you identify, and by a much higher rate of losses that is cumulatively a reflection of that 25% distributed across the entire client base. Im not an economist, I dont know how you calculate that. But I do know Greens are fond of whining about “externalised costs” and thats one they are silent on. Of course I pay attention to the onerous situation in the UK, and the harm many of those “pretendedly green policies ” have done to private business . Especially to medium and small businesses. The same has happened here in Spain. I only hope your Prime Minister is able to reverse the policies, and the trend… And our Prime Minister, too. Peter Lilley was a prize-winning oil analyst at the stock broker, Greenwells, before he went into Parliament. His research was always thorough and his opinions well-respected. On another point. ” PS The only joyous thing in this sorry story is that the Marxist idiot who implemented most of these stupid ideas has been put in jail for 8? Months on an unrelated issue. The Lord works in mysterious ways”. Unfortunately in the UK prison sentences do not mean what they say. The “Marxist Idiot” is expected to be released in a few days time after serving only two months. Only if a prisoner is sentenced to “life with a minimum of x years” can he be expected to serve the full x years. Otherwise he will almost invariably be released after x/3 years (rapists and terrorists included). The millionaire “Marxist Idiot”, who had left his hitherto loyal Lib Dem wife for his lesbian PR assistant, was unlucky to be tried and sentenced. His fellow Lib-Dem millionaire cabinet minister, who fraudulently claimed parliamentary amounting to tens of thousand of pounds (which he paid back), was never indicted and is now back sitting at the Cabinet table, even though he is no longer a full member of the Cabinet. “Mr Cameron has also appointed the former Tory minister Peter Lilley to his advisory board…. For those who are unfamiliar with British politicians Peter Lilley is a Conservative Party politician who has been a Member of Parliament since 1983. He has served under Margaret Thatcher and John Major and has held the ministerial post of Trade and Industry Secretary. He went to Cabridge where he studied Economics and Physics. Before entering parliament he was an energy analyst a City of London stockbrokers. He is a Non-Executive Director at Tethys Petroleum. He is one of the most qualified UK politician voice informed scepticism about the UK’s energy policy. Expect minds to slowly turn as he points out the still missing hotspot and other failed predictions such as NH to expect warmer winters. To be fair to many members of the Conservative Party, they have always been skeptics, but they weren’t in Government from 1997 to 2010 and they are now in coalition with a party far more green in its tendencies. They have really had to wait the 15 years of no warming to be able to come above the parapet, which they are now starting to do. Mervyn says at May 12, 2013 at 12:12 am. The British government is legally obliged to comply with the Climate Change Act 2008. In the UK, the only way to bring about real change in attitude to climate change is by repealing the Climate Change Act 2008…… And there is no evidence of that! Fickle Cameron is scared of UKIP. He’s performing somersaults over a EU referendum as well. A referendum which he could just call if he wanted. His coalition partners even had an In/Out referendum as a pledge in their manifesto for this parliament. He could do it if he chose. All this means nothing, for nothing this Government does has any meaning. Actions without integrity are just flailing with the wind. Let’s not forget Greenpeace whose activists are working in the very heart of the IPCC. Jimbo, ….and Peter Lilley was one of only three MPs to vote against the Climate Change Act 2008. Here is a great overview of the present state of the climate wars. [On topic] Quote of the Week from Pointman??? When the ordinary person is prosperous and feeling good, it gives them the time, the leisure and the disposable wealth to care about things beyond life’s essentials. It’s not difficult to get them interested in the environmental fundamentals such as clean air and water, and conservation of endangered flora or fauna. Conversely, when people are hungry, desperate or under economic stress, care for the environment drops to the very bottom of their list of concerns. Every honest opinion poll in the developed world has been showing this since the recession began. In the developing world, if desperate people need heat and light, they’ll keep doing things like burning every tree in sight until there isn’t a single one left, Haiti being an extreme and terrible example of the latter…. The last sentence is something I’ve been harping on about for ages. More importantly, Nigel Farage of the UKIP party said that windelecs (wind turbines) are a complete waste of space – and then hoovered up 25% of the vote in local elections. a. because it is costing them an arm and a leg in fuel bills. b. because it is so darn cold. “…action to tackle global warming is falling victim to Treasury intransigence.”!!!!!!!!!!!!!!!!!! What a turn of phrase. These terrible interlopers are ruining everything by telling the government that we are fast becoming broke with the green energy economy. The “experts” that are abandoning the ship won’t have anywhere to go, but being experts, they can morph into coal and nuclear energy experts. The costs of running the diesel generator was less than the earnings from the attractive feed in tariffs being paid for green energy production. They were also plugging floodlights into the mains and shining the lights on the PV panels, I believe. We will have to see.. After all the tax funded green agenda has greased a great many palms.. There are a lot of favors floating in the air, a lot of tax funded business interests that will not go quietly into the night..
Its all nice to talk about tearing up contracts.. Here in Ontario it cost the tax payer 650 million dollars so Dalton McLyingLips could move two gas power plants, that put his reelection into question.. This article in today’s Independent however, shows just what an uphill climb we still have here apropos the fundamental arguments. The comments are almost universally in favour of the article, which is utter rubbish; and this by the way is the paper read by many of the ‘bien pensant’ teachers, journalists and other such opinion formers (others read the Guardian which is even more avidly anti CO2 and pro AGW theories. This is an important precedent. In democracies AGW can be kicked out if a skeptical constituency can be empowered by a party articulating opposition to AGW. What is needed is enough people to start thinking over climate issues rationally with access to the true facts. Readers please note, Mr Chris Huhne (and his wife) were released from prison today(two months into his 8 month sentence for ‘perverting the course of justice’). As he is now persona non grata in political circles he is presumed to be going to concentrate on his interests in ‘green energy’, God help us! cater a platform to show you an exit strategy to sell your VER carbon credits. you from the market right now. Trading on over-the-counter markets requires experience, knowledge and skill. You may lose money on your purchase by not getting a competitive rate when trading a small volume of carbon credits or not being able to sell your credits at all. As we do not fall under the category of an investment product as stipulated by FSMA (The Financial Services and Marketing Act). This means that you are not eligible to any recourse under the Financial Services Compensation Scheme (FSCS). please notify the sender and delete the e-mail transmission immediately. Security Warning: Please note that this e-mail has been created in the knowledge that internet e-mail is not a 100% secure communications medium. We advise that you understand this lack of security and take any necessary measures when e-mailing us. CNTX Limited ensures the highest levels of integrity and due diligence is performed on all aspects of its un-regulated business.